Memo Suggests Cause Of 1968 Mine Deaths Forty years ago, an explosion in a Farmington, W.Va., coal mine killed 78 men. The cause was a mystery for years, but a recently-released memo reveals that an alarm — that might have saved the miners — was disabled. 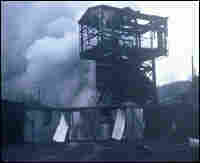 Smoke billows from a mine portal after the explosion in the No. 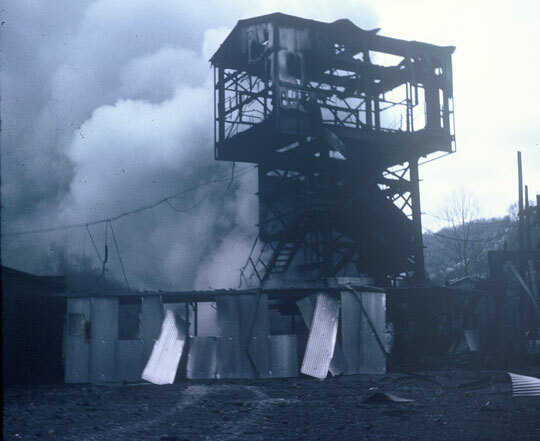 9 mine in Farmington, W.Va., in 1968. NPR obtained a copy of the memo that reveals a safety alarm was disabled. The alarm might have saved the coal miners that died in the disaster on Nov. 20, 1968. What's more, if the widows of the miners had known about the memo, they could have used it to hold the coal company accountable for their husbands' deaths. Harrison County Circuit Judge Jim Matish was nearly 15 years old when his father was killed in the mine explosion. He says the recently released memo could be evidence of a criminal act. Mine foreman Pete Sehewchuk (center), who worked the afternoon shift in the No. 9 mine the day it exploded, and a crew of miners travel into a nearby mine in West Virginia. For 40 years, it has been a mystery why 78 men died in a mine explosion in Farmington, W.Va.
At the time, federal officials said they didn't know. But several months after the explosion, a federal investigator discovered one possible explanation — a safety alarm on a ventilation fan had been deliberately disabled. The investigator put his findings in a memo, which his superiors simply filed away. It has remained unknown to the public until now. That memo — and sworn testimony taken after the disaster — suggest that no one had to die on Nov. 20, 1968. Had this alarm been working, the men most likely would have been evacuated before the explosion. At about 5:30 a.m. that day, explosions and fire rocketed through the mine. Some of the men died instantly from the blast's concussion. Others were overcome by poisonous gas. 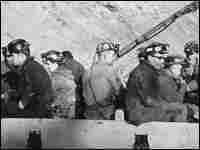 It was the first major mine disaster to be nationally televised. Americans watched for days as anguished relatives, such as Betty Friend, held vigil at a coal company store. Friend's brother was trapped in the mine. "I have great hopes, and our family has great hopes that maybe God will be with us and with all these other families, and bring all these men out," Friend said through sobs during a television interview at the time. On the 10th day, company officials sealed the mine, with the bodies of 78 men still inside. The families gathered at a church to hear the news. "There was never such wailing and crying and screaming," said Jim Matish, who was nearly 15 at the time. "It's just hard to imagine." Just days before the explosion, Matish's father had said the mine was in the worst shape he'd ever seen. Matish overheard his father, Frank, tell his mother he wanted to quit. "I can remember her telling him that evening, 'Well, why don't you just call, why don't you just quit and not go?' " Matish says. "And he said, 'We've got a son that we need to worry about educating.' "
Mine foreman Pete Sehewchuk worked with Frank Matish in the No. 9 mine. He says safety sometimes took a back seat to production there. "I told my wife at that time, 'That mine is going to blow up.' There are a lot of shady things that went on back there," he said. After the Farmington disaster, company officials reopened the mine to recover the bodies. An electrician tried to restart a large ventilation fan — the Mods Run fan — and noticed its safety alarm had been disabled. This same fan had stopped working shortly before the explosion. Its alarm should have sounded, signaling the miners to evacuate. But it didn't, and 78 men died. A federal investigator sent a memo about the sabotaged alarm to top officials at the U.S. Bureau of Mines. 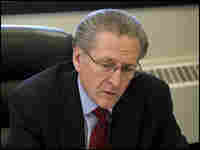 But William R. Park, district manager for the bureau, ordered the memo to be filed away. That memo and sworn testimony tell the grisly story that unfolded that cold November morning. At about 3 a.m., mechanic Alex Kovar was called to the mine because of a problem with the power at one mine entrance. Kovar arrived at 3:45 a.m., checked one of the mine's ventilation fans, reset a circuit breaker and began repairing a shuttle car. Records show he checked the one fan and found it operating. He did not check the Mods Run fan before the explosion. That fan already had blown apart, shooting some of its blades through its metal casing. At 4 a.m., the noise and smoke from the broken fan woke a couple who lived in a house nearby. Based on past experience, Samuel Stout and his wife thought the Mods Run fan had gone down again. "It had a fashion of throwing the blades off it and making a big noise, you know," Stout said in sworn testimony. Shortly after they heard the noise, Stout's wife asked him what time it was. He looked at the kitchen clock and it was 4 a.m.
That meant the fan wasn't working for at least an hour and a half before the explosion, allowing dangerous levels of methane gas to build up. Russell Foster, who had been monitoring the fan safety alarm system, said no alarms sounded that morning. Section foreman George Wilson was still mining coal 500 feet underground when he lost power just before the 5:30 a.m. explosion. "I had taken two to three steps when this thing came in on us," he testified at the hearings. "It just sounded like 'whoosh-whoosh,' just like that through the air, and there was flying debris, rock dust, coal dust and everything so intense you couldn't see." He and his crew began crawling toward their first-aid station, a space cut into the side of the tunnel. "Our visibility was completely gone, and in order to keep grouped up together, we kept talking to each other," Wilson said. He and seven of his men located gas masks and breathing devices known as self-rescuers. When they realized 24-year-old Paul Henderson wasn't with them, they sent two men back to find him. They searched in the rubble but found only his dinner bucket. Just in case he came back, they wrote him a note in the dust on the side of a coal car, telling him to come to the air shaft. Together, the eight men stumbled and crawled through heavy smoke to the bottom of an air shaft and waited to be rescued. One man with a gas mask went back again to find Henderson, but he wasn't to be found. At 8 a.m., another blast hit the mine. 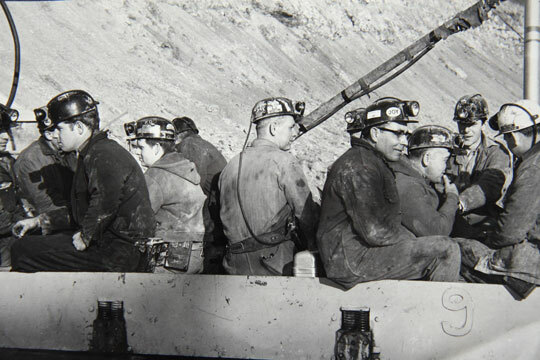 The smoke was intense, and even with breathing devices, five of the miners, including Wilson and Lewis Lake, passed out. "Gary Martin, he had a gas mask, and he slapped me on the face and he said, 'Lewis, if you don't wake up and help me, we're going to lose two or three of these men,' " Lake testified during the hearings. "So I got on my feet; I could hardly stand." At first, they yelled and pounded on a pipe with a piece of wood. Hours passed before men on the surface found them and dropped supplies into the hole. At 10:08 a.m., the two men in the worst condition were lifted from the shaft in a large bucket. And by 10:40 a.m., all eight men were out of the mine. In all, 21 miners escaped that morning. On the day before the explosion, methane gas forced two crews to stop mining. The same thing had happened in another section of the mine on the afternoon shift. Zack Springer said he had to stop mining twice to clear away gas in a section of the mine that was heavily damaged in the explosions. Springer's supervisor, Sehewchuk, said in a recent interview that it took about an hour to clear the methane that night. On another night, Sehewchuk said he discovered he had no air in his section because the Llewellyn fan had gone down. The power should have shut off automatically, but it didn't, so he cut the power himself and sent his men to the dinner hole and called the dispatcher. The mine foreman should have called the men out of the mine, but he didn't, Sehewchuk said. "I complained to the superintendent, but it went in one ear and it went out the other," he said. A few days after the disaster, Sehewchuk was summoned to testify at the investigation hearings held by federal and state officials. He said a coal company official called him and told him not to go. "They knew my attitude before the explosion and probably that was the reason for it," Sehewchuk said. He told them he didn't want to be arrested, and they told him they'd take care of it, he said. Records show that of the 84 people called to testify, only 47 did so. They were questioned by state and federal officials, leaders from the United Mine Workers of America and a Consolidation Coal attorney. Inadequate rock dust, which was used to coat the exposed coal and coal dust to keep them from igniting. Dangerous accumulations of loose coal and coal dust along track haulage roads, shuttle car roadways and belt conveyor lines. Too many temporary splices and exposed wires in trailing cables that carried electricity to mining equipment from underground energy substations. They told of poor ventilation and a lack of water pressure on equipment used to keep coal dust wet around the continuous miners, which chewed the coal out of the mountain. And many said rock dusting was inadequate and too much coal dust often built up on conveyor belts and in the ventilation tunnels called crosscuts. The miners' testimony leaves little doubt that people were taking shortcuts at the No. 9 mine. And the memo showing the safety alarm had been bypassed on the Mods Run fan provides the missing puzzle piece that explains how the disaster may have happened. Had the widows of the miners known about the memo at the time it was written, they could have used it to hold the coal company accountable for their husbands' deaths. Instead, most reached a $10,000 settlement with the coal company. Larry Lane — the memo's author — could not be located. Many officials involved are dead. The public may never know why the memo was never revealed. The federal government finally issued a report on Farmington, more than 20 years later. The 1990 report makes no mention of the memo or that someone deliberately disabled the alarm. 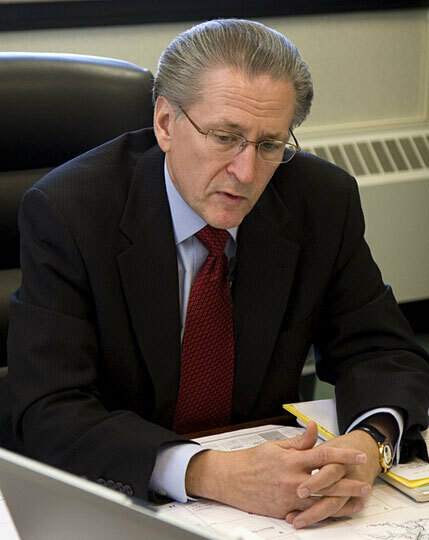 Jim Matish, who is now a West Virginia judge, says someone should have been held responsible. "In my opinion, it amounted to a criminal act," Matish said. Officials with the federal Mine Safety and Health Administration and with Consol Energy declined to comment for this story. They said the mine disaster was a part of history now. But the people of Farmington still remember. Matish has trouble talking about the last time he told his father goodbye. "So long, Dad," Matish said. "Don't work too hard ... and be careful." After Farmington, Congress passed landmark mine safety legislation. For the first time, the federal government could fine companies for safety violations and even bring criminal charges against the worst offenders. Before Farmington, about 250 coal miners died every year in the United States. Today, that's down to about 32. Scott Finn reports for member station West Virginia Public Broadcasting and Bonnie Stewart is a professor at West Virginia University.